Driving the Area Wireless Car 6lL for Lucy answering urgent 999 calls, was a job I loved, as you were always the first on the scene, and there was always plenty of action. We were told that nobody had been injured, and they were just threatening each other. My wireless operator and I moved amongst the crowd, listening to the story. I wished them all goodnight and got them moving homeward, when I saw my colleague putting a man in the back of our car whom he had just arrested. I asked why, and he said, "Razor," patting his tunic pocket. I was pleased he had taken it from him, as I didn’t fancy the young man with one of those dangerous things sitting behind me in the car. At the station, I stayed with the prisoner in the charge room, whilst my colleague, went to prepare the charge sheet. He was sitting at a long bench, and I was leaning on the tall charge room desk, and we were having just a general pleasant conversation. I gave him a cigarette, and we were yarning together, when the door opened and in walked my Chief Inspector, accompanied by the Chief Superintendent, someone akin to god to us lowly peasant PCs. I sprang to attention, stubbing the cigarette out beneath my heel surreptitiously, and it was the strangest sight to see the prisoner doing exactly the same thing. 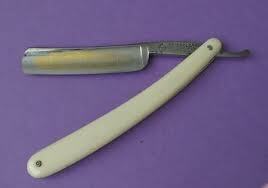 I was asked what he was being charged with, and said, "An offensive weapon sir, a razor." The top man stood in front of the hapless prisoner, and wagging his gloved finger at him, he said," There is too much of this sort of behaviour. If you could see what poor doctors have to do in emergency units, you wouldn’t be so keen on carrying such a dangerous thing. I hope the magistrate takes all that into account when you are dealt with tomorrow."